Theatre has had few success stories as dramatic as Vault in recent years. 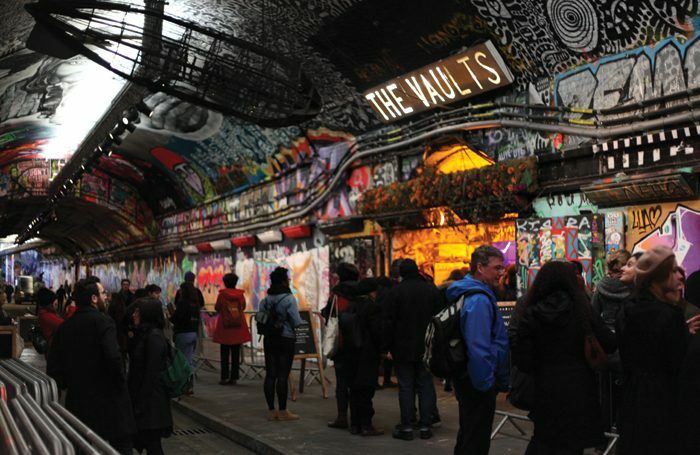 The annual festival, which has been held in the railway arches beneath Waterloo since 2012, has grown from humble beginnings to become one of the linchpins of the theatrical year and a key event in London’s cultural calendar. The debut edition had just 25 shows, and welcomed 7,500 people over three weeks. Last year’s festival lasted eight weeks, during which more than 75,000 audience members delved deep underground to sample more than 350 shows. It’s no exaggeration to say that, in terms of theatre at least, Vault is now one of the UK’s most significant fringe festivals, second only, perhaps, to Edinburgh. What makes it so special? It’s partly to do with its financial model – a 70:30 box office split between artists and festival, after a 19% “venues facilities fee”, or a 60:40 split after a 15% fee – meaning there’s little risk involved for performers, but its also a matter of geography. Vault is in central London (underneath central London, in fact), and thus easily accessible for a huge chunk of the theatre industry, producers and programmers included. It can act as a springboard, catapulting theatremakers to Edinburgh, national tours and beyond. And it keeps growing. In recent years, the festival has burst out of its rabbit warren to occupy several nearby theatres and performance spaces – Network Theatre, Waterloo East Theatre and the bookshop Travelling Through, as well as a collection of pop-up venues and found locations, from shipping containers to moving cars. This year, the Horse and Stables Pub has been colonised: charity Child.org is hosting a stage, proceeds from which will go to its programme supporting pregnancy services in Kenya. The number of shows on offer has increased again, too. More than 400 shows have been announced so far, with theatre jostling for place alongside a bill that includes comedy, music, storytelling and more. There’s plenty to look out for, from established names to emerging artists and interactive games to hard-hitting drama. This year’s festival hosts several already-successful shows – hits from previous editions, from Edinburgh, and from elsewhere. Chief among these is a fresh production of Counting Sheep. 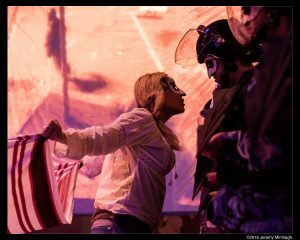 Mark and Marichka Marczyk’s immersive work explores the 2014 pro-European protests in Kiev’s Maidan Square against Ukraine’s pro-Russian president, Viktor Yanukovych. These protests led to the Ukrainian revolution, and eventually to the Russian annexation of Crimea. The show, which invites audience members to dance, dine and demonstrate with the performers, was first seen at the Edinburgh Festival Fringe in 2016, where it garnered critical acclaim and won a Fringe First award. This new version has been created in collaboration with Natalia Kaliada and Nikolai Khalezin, underground protest artists of Belarus Free Theatre, and it runs throughout the festival. Hits from last year’s Edinburgh Festival Fringe include Jim Harbourne’s warming, whimsical folk storytelling show The Myth of the Singular Moment. There’s also Ladykiller, the blood-spattered, Pleasance Award-winning comedy from new-writing company the Thelmas, and Jericho, an intellectual, idea-driven show about professional wrestling from Dublin-based collective Malaprop. Fringe hits from emerging companies supported by London’s New Diorama Theatre arrive for a two-week takeover in early February. These include Nouveau Riche’s four-woman exploration of misogynoir Queens of Sheba (winner of one of The Stage Edinburgh Awards), cult comedy-horror creators Kill the Beast’s inventive film-shoot-gone-wrong Director’s Cut, and Hull-based company Silent Uproar’s upbeat musical about depression, A Super Happy Story (About Feeling Super Sad). All are well worth seeing. There are several eye-catching physical-theatre shows on the bill, too: Incognito Theatre’s 1920s crime drama Tobacco Road, Silent Faces’ sea-soaked exploration of mental health A Clown Show About Rain, and four shows from playful ensemble the Pappy Show, including its well-travelled celebration of masculinity, Boys. As well as providing an accessible London home for existing hits, Vault is also a fertile breeding ground for fresh fringe fare that often goes elsewhere afterwards, and there’s plenty of exciting new work on offer this year, from performance art, to mime, to gig-theatre. It will be intriguing to see Space Opera, the new show from storyteller James Rowland, who created the slippery, tear-jerking trilogy Songs of Friendship that began in 2016 with Team Viking and was completed last year with Revelations. Equally enticing is Nikolaos the Wonderworker, a rehearsed reading directed by Vault stalwart and sometime magician David Aula, and performed by Olivier-winning actress Juliet Stevenson for two nights only. Journalist-turned-playwright Joseph Charlton provided one of the most exhilarating new plays of last year’s festival with Brilliant Jerks – a thrilling dissection of the rise of Uber – and he’s back again this year with Anna X, another play based on real events that delves deep into New York’s social scene. His writing is slick and sophisticated, and this could prove one of the festival’s best new plays. 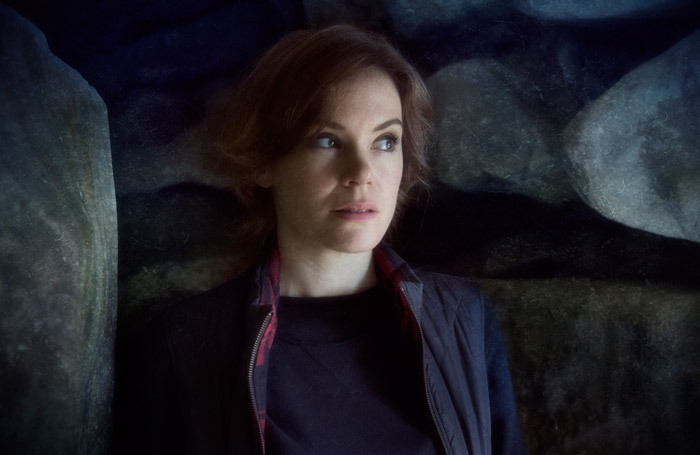 Hermetic Arts – Chris Lince and Carrie Marx’s horror-focused company – also made waves a year ago with their slyly intelligent, seriously scary podcast-turned-play Unburied, and they return this year as well. Details are scarce about April, but it’s got something to do with a YouTube positive-thinking guru, and will almost certainly frighten the life out of you. The pick of the pant-wetting provisions at the festival, undoubtedly. Other theatremakers bringing brand new work to Vault include Lewis Doherty, whose one-man film-noir mime Wolf was brilliantly funny is doing the same thing again with his one-man medieval adventure Boar. Wildcard, the production company behind gig-theatre Edinburgh hit Electrolyte, is staging 17, a Bruntwood-longlisted new play by Frankie Meredith; and Emergency Chorus, an exciting duo of performance art practitioners hailing from Warwick University, is presenting Landscape (1989). Other interesting new work includes JMK Award-winning young director Josh Roche taking the reins of a Virginia Woolf adaptation in Lucy Roslyn’s Orlando, and Lucy Jane Atkinson, one of The Stage’s top talents to watch at Vault 2018, is directing Irish writer Barry McStay’s Vespertilio. Lizzie Milton’s new play 10 celebrates ten iconic women overlooked by history. Immersive and interactive theatre has always been a big part of what happens at the Vaults, in and out of festival season, and this year’s line-up is no different. In addition to headline show Counting Sheep and Darkfield’s ubiquitous, disconcerting container shows Seance and Flight, a variety of experiences are being staged in a variety of found spaces and pop-up venues. These range from the gently immersive (Living Record Productions’ Thrown invites you to slip on binaural headphones, The Encounter-style, and have whispered memories wash over you) to the more extreme end of the spectrum: Dank Parish, one of the creatives behind the immensely successful immersive festival Boomtown, makes its London debut with The Church of the Sturdy Virgin. It is described as “a surreal, immersive theatrical experience exploring our connection with death, inviting you to teeter on the brink of uncertainty, to choose the manner of your descent into the void”. As well as the theatrical stuff, this year’s comedy slate boasts plenty of one-off works-in-progress from big names and emerging comics (James Acaster, Ivo Graham and Phil Wang are all making an appearance, as is Edinburgh best comedy newcomer award-winner Ciaran Dowd). There is also poetry, podcast recordings, and immersive events that go on late into the night – Ruckus, Specifiq and Rogue Productions’ Peaky Blinders St Patrick’s Day party, is back again and probably the pick of the ‘lates’.